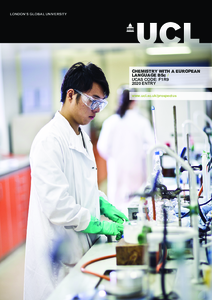 This BSc programme provides a thorough grounding in all major aspects of chemistry and fluency in one of a range of languages, including French, German, Italian and Spanish. Graduates will be well placed to work in mainland Europe or as part of a multinational company. Chemistry, plus one of Biology, Physics or Mathematics required. Any language preferred as third subject, but not essential. English Language at grade C or 5, plus Mathematics at grade B or 6. For UK-based students a foreign language at grade B or 6 is required. AA in Chemistry, plus one of Biology, Physics or Mathematics required. Any language preferred as third subject, but not essential. A score of 18 points in three higher level subjects including 6 in Chemistry and 5 in one of Biology, Physics or Mathematics, with no score lower than 5. Any language preferred as third higher level subject, but not essential. A score of 17 points in three higher level subjects including 6 in Chemistry and 5 in one of Biology, Physics or Mathematics, with no score lower than 5. Any language preferred as third higher level subject, but not essential. Pass in Access to HE Diploma, with between 23 credits awarded with Distinction in the Level 3 units, the remainder of the Level 3 units awarded with Merit. D3,D3,D3 in three Cambridge Pre-U Principal Subjects, including Chemistry and either one science or Mathematics. Any language preferred as third subject, but not essential. AAA at Advanced Highers (or AA at Advanced Higher and AAA at Higher). Chemistry and either one science or Mathematics required at Advanced Higher. Third Advanced Higher in any language preferred, but not essential. Successful completion of the WBQ Advanced Skills Challenge Certificate plus 2 GCE A-Levels at grades AAA, including Chemistry and either one science or Mathematics. Consistently regarded as one of the best chemistry departments in the UK, we offer you an excellent education with high standards of teaching. You will benefit from our outstanding research profile as you are taught by lecturers who are experts in a wide range of chemistry-related fields. The UCL Centre for Languages & International Education (CLIE) and the specialist language departments offer excellent modern language-learning aids such as computers, video and satellite links. We offer access to state-of-the-art facilities, enhanced by our strong affiliation to other centres of excellence such as the London Centre for Nanotechnology. This programme is offered either as a three-year BSc or as a four-year MSci. The first two years of study are identical, so you can defer which to opt for until the end of your second year. We advise you to select the four-year MSci programme initially as this keeps more options open. You do not have the opportunity to study abroad on the BSc programme. The chemistry content directly follows that of the single-subject Chemistry programme. You will cover the full range of chemistry core components, together with optional modules in chemistry and other options from outside the department. Around 25% of your time will be centred around CLIE and the specialist language departments, providing a continuous progression of language and related modules. The language component is taught in small groups with common levels of fluency ranging from complete beginners to experts. In the final year you will also undertake a compulsory literature project. You will select two 0.5 credit modules in the same language through CLIE, plus a Mathematics module appropriate to your level of qualification to the value of 0.5 credits. You will select two 0.5 credit modules in the same language through CLIE. You will select two 0.5 credit modules in the same language through CLIE, plus a further 0.5 credits from a wide range of chemistry and other approved undergraduate options. Your learning will combine lectures, practical classes and group workshops. In addition you will attend tutorials in groups of four to six students which provide specialised support for the core modules. Each module will usually involve at least two methods of assessment. These may include coursework (problem sheets, essays or poster presentations), an examination, or laboratory classes. We believe in providing feedback to students, such as face-to-face marking in laboratories. Your third-year project will be assessed through a written report. Detailed course descriptions are available on the department website: Chemistry with a European Language BSc. As a UCL Chemistry graduate you will have developed both discipline-based and highly sought after analytical skills, for example in logical thought and numeracy. On completion of your degree you will have the obvious option of pursuing a career within the chemical industry. This is recognised as one of the most exciting and successful contributors to the UK economy, for example in the pharmaceutical, biotechnology and nanotechnology sectors. Many recent graduates have continued in research at universities including PhDs at UCL, Imperial, Oxford, Cambridge, Bristol, Edinburgh, Harvard, Manchester and NUS Singapore. Our graduates are in great demand in many other fields such as management, the financial sector, information technology, scientific journalism, patent law, the scientific civil service, and in education. UCL Chemistry offers a number of scholarships, including the Bader Bursaries, GSK Bursary, UCL Chemistry Entrance Scholarships and the Kathleen Lonsdale Bursary. Together with essential academic requirements, we are looking for strong evidence in your personal statement of your interest in the subject and your understanding of it. These requirements may be evidenced by examples of project work, relevant work experience or, perhaps, through your knowledge of current events involving chemistry. We also look for your ability to communicate clearly in English. UK-based applicants who demonstrate their potential to meet our academic requirements will be invited to visit UCL for a day. The day will include talks, the opportunity to meet current students and a tour of the department and UCL. You will also attend a university-level lecture. You will also have a 20-minute discussion with one of our academic staff in order to explore what studying at UCL will be like. This discussion will form part of our decision-making process. If you are based overseas, attendance at a visit day is impractical. Instead, you will be sent a presentation of the material that is covered with UK-based students. You will also be sent a series of chemistry questions for discussion by email or telephone. We aim to contact you about the outcome of your application within 48 hours of your interview or, if overseas, on concluding our discussion.